The photo above was taken while the Montgomerys were on vacation in Naples, Florida. 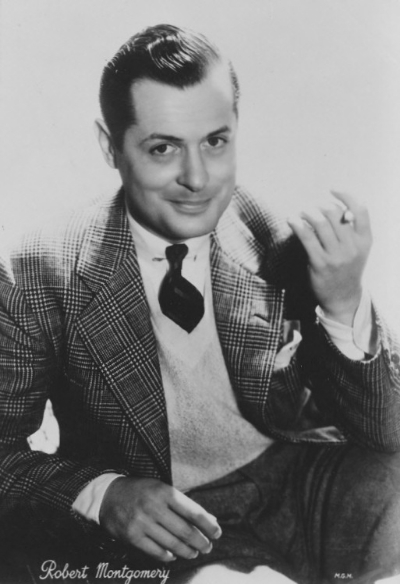 Bob had just finished directing The Desperate Hours on Broadway, while still involved in Robert Montgomery Presents and spending considerable time as media advisor for Eisenhower. A well-earned vacation no doubt. White slacks and shoes seemed to be Bob's favorite casual outfit. I've always considered that to be a sign of wealth, as in how else could one relax while wearing white. You can bet It wasn't Buffy who took care of any grass stains. They were apparently a happy couple. Both with big smiles. 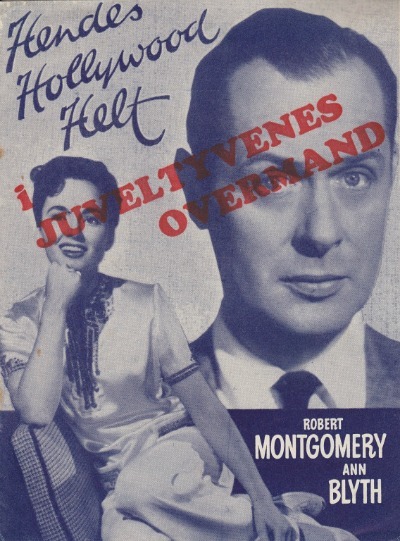 Heaven forbid that the very formal Mr. Montgomery would ever put his arm around Mrs. Montgomery in public, but that was not necessary to show their feelings toward each other. Why, Oh Why, Won't They Let the Poor Boy Alone? Modern Screen, 1934 --- Don't they make an attractive pair? 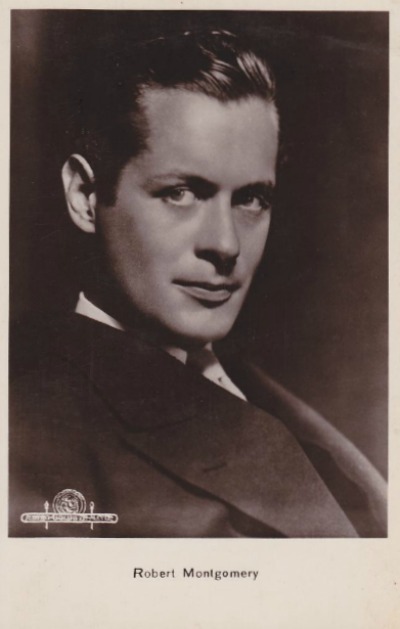 Maureen O'Sullivan and Robert Montgomery. They are appearing together in "Hide-Out" for MGM. When the picture was completed, Maureen packed her bags and, escorted by Johnny Farrow, who is probably her husband as you read this, journeyed to her native Ireland. Meanwhile, Bob is still busy spiking divorce rumors. Why, oh why, won't they let the poor boy alone? He seems to be satisfied with things as they are, domestically, socially and otherwise. But the rumor hounds will persist in having their field day. Incidentally, you'll see the young man in "Biography," too, in the near future. 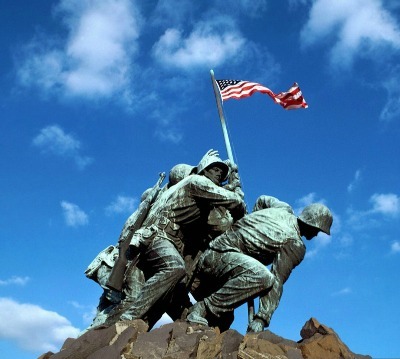 Have You Remembered to Display Your Flag? No matter the language, two enjoyable movies. 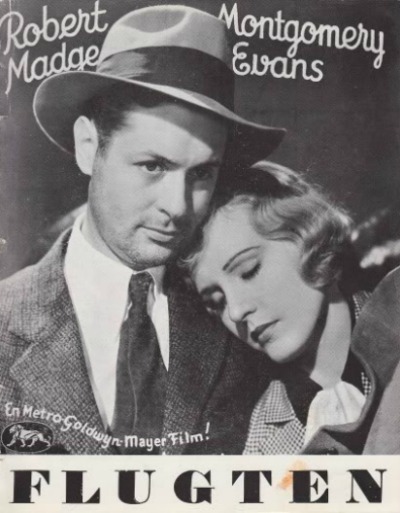 Fugitive Lovers (1934) or, my best guess, Flight in Danish. 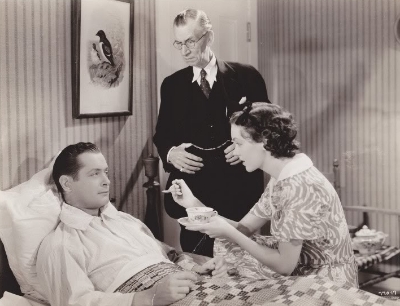 Once More, My Darling (1949) or Her Hollywood Hero. Yep...it's the smile, the mischief and charm. 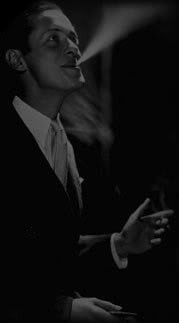 Just in case you don't already have a copy, or you'd just like to spend the day with Bob, TCM will be showing six of his movies on his birthday tomorrow. 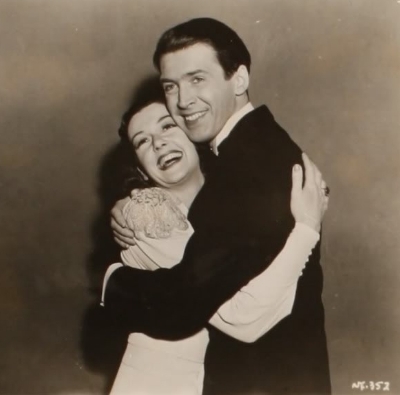 And below, Roz Russell gives birthday boy, Jimmy Stewart a big hug. Looks like they're both enjoying it. Constance Cummings, was born on May 15, 1910, in Seattle, Washington. She was married to writer Benn Levy from 1933 until his death in 1973, not a bad run for a Hollywood marriage. Constance, not happy with her movie career nor life in Hollywood, moved with her husband in 1934 to England where she continued her acting (including Haunted Honeymoon with Bob) until 1986 and died in 2005 at the impressive age of 95. Maureen O'Sullivan's life geographically went in the opposite direction of Contance, being born in Ireland May 17, 1911, and moving to the states for a successful and lengthy acting career. 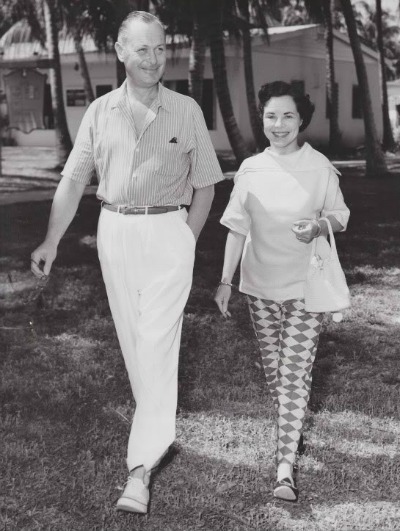 Like Constance she married a writer (later director), John Farrow. 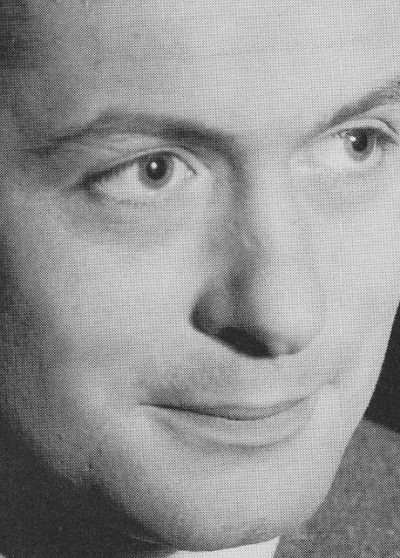 They were married from 1936 until his death in 1963, a marriage producing seven children. How she managed to have seven children and a successful, busy acting career, I have no idea. Maureen acted into her 80's, passing on in 1998 at the age of 87. Hide-Out is one of my favorite movies, she and Bob made a really cute couple. Wish they had made a follow-up movie together. 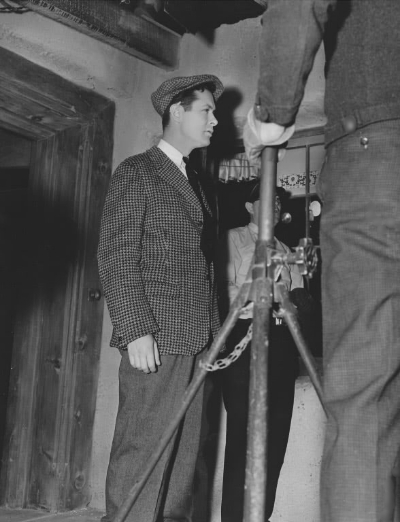 To quote the photo description used by the studio: ON THE SET WITH ROBERT MONTGOMERY'S CANDID CAMERA. 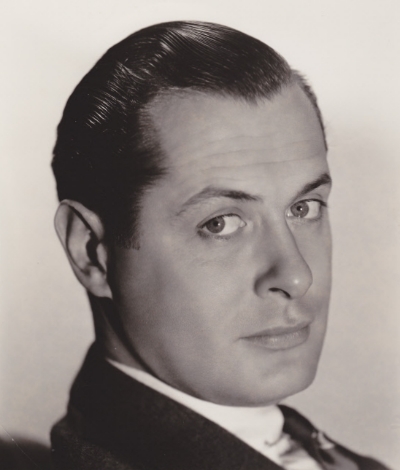 Robert Montgomery always has his candid camera on the set with him, and photographs everything in sight between scenes. When he wants to be in the picture himself, either the cameraman or some friend snaps the camera after he sets and focuses it. 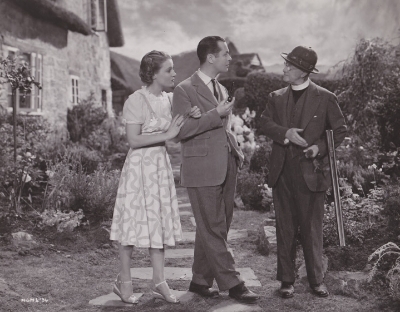 The photo, taken on the set of Night Must Fall, was personally developed by Montgomery. 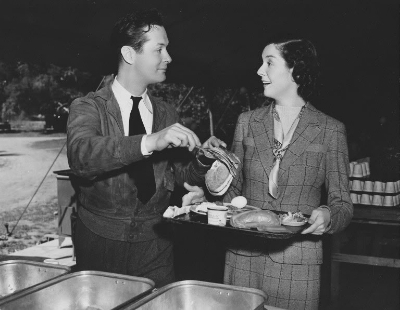 Here he serves Rosalind Russell at lunch, in the open air cafeteria established on location at Sherwood Forest. 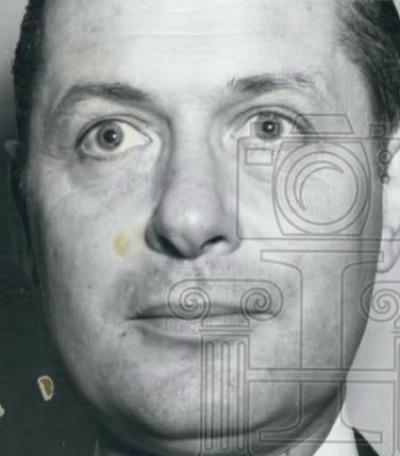 Richard Thorpe, the director, also a candid camera enthusiast, used Bob's camera. A similar write-up was used for the photo below. Which leads to the obvious question: what on earth happened to all those other photos he took on the set over the years? How sad to lose all those records of movie history. This is a follow up to my May 7th entry wherein I mention touch up work on Bob's face ... This is the photo used in Dangerous Men that shows Bob without makeup, the face blown up a tad. You can see a few blemish marks, the circles under his eyes and an eyebrow in need of trimming. All will require touching up. The following photo was taken in 1946 by a wire service photographer who obviously did not do any retouching. 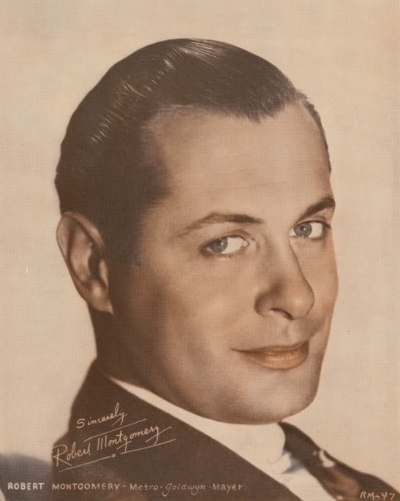 As Hurrell said, early pancake makeup was really horrid on an actor's complexion, requiring extensive touch up work for many of his subjects. I rather like the idea of Bob's face not being perfect. Makes him seem more real to me. Note the original Bob portrait above and the colorized version below. Of course the original photo is already retouched ... no one has such glacially smooth facial skin. If nothing else, they've removed any trace of facial hair. In his off camera photos, his upper lip especially looks always in need of a shave. He probably grew that mustache for Trouble for Two in a matter of days. In the colorized photo there is more retouching ... the forehead wrinkles are lessened, the cheeks are changed, and now he even has a smile. Hmm ... as in going one step too far. Hey! I've Finally Seen Skylark! I finally got a copy of Skylark --- thank you, Carrie. It IS a good movie, darn good actually. But, then, how could it not be. 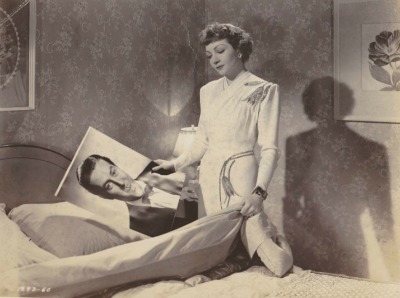 You take a good director (Mark Sanrich), three talented stars at their peak (Claudette Colbert, Ray Milland and Brian Aherne), the usual stalwart supporting cast (Binnie Barnes, Walter Abel and Mona Barrie in particular), an excellent, witty script, and SURPRISE, it works! The rating on IMDB is only 6.3. I do not understand that at all ... well, it is in black and white, and it was made 72 years ago, and Claudette who? Maltin's ***1/2 rating is much more on track. For me, a movie is good if I enjoy it and feel better having watched it ... keeping things simple, life comes with enough complications.